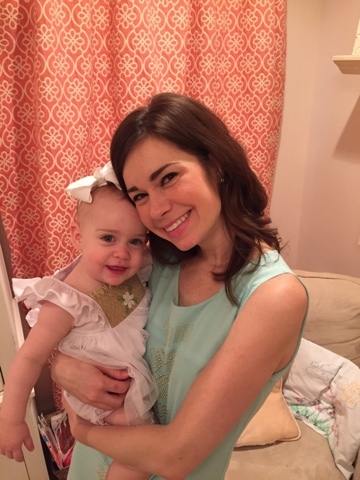 Last year's Easter was a blur--C was in the middle of a growth spurt that lasted a week and I hadn't slept for more than 2 consecutive hours in a week. 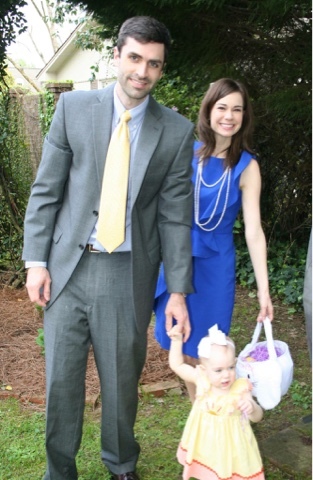 We were having her baptized on Easter Sunday and all of our family was coming in to celebrate and have lunch at my parents' (thank goodness I had the foresight to have the party there and not at my house!). It was such a special day, one that really kept us in the spirit of what Easter is actually all about. This year was different of course! Easter bunny, egg hunts, you name it we were scoring pretty high on the commercial Easter stuff but man oh man was it fun to experience through her eyes! We started the Easter festivities with a trip to the Easter Bunny at the mall. I was REALLY nervous about Charlotte's behavior because she was not a big fan of Santa but I figured it was worth a shot--all we had to do was leave if things went south. 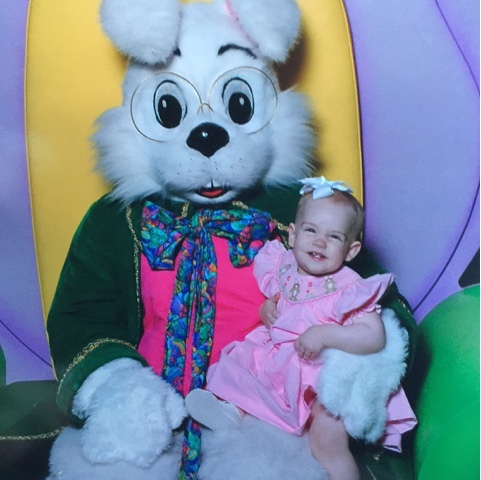 Well, that sweet girl LOVED the Easter bunny--so much so it was difficult to get a good picture while she was petting him and trying to pull his glasses and pointing at him like "OMG do you see this!!??" I finally got her to "wink" and we were able to snap this picture. She didn't want to leave him and kept pointing back at him as we walked away. Sweet girl! I was not super keyed up about her doing an Easter egg hunt this year because quite frankly I didn't see the point if she wasn't walking. Well, she started walking on the Tuesday before Easter and luckily she had 2 events that Saturday that included egg hunts! Hooray! 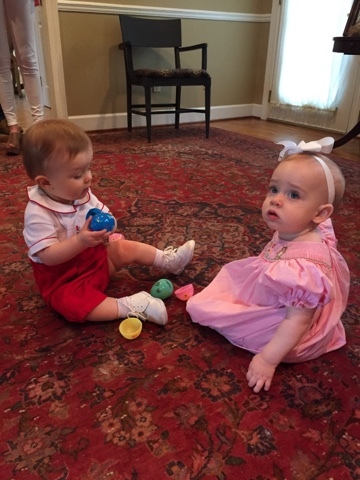 First we attended a birthday party for her little friend Brooks. This was actually the first baby birthday party she had been to. 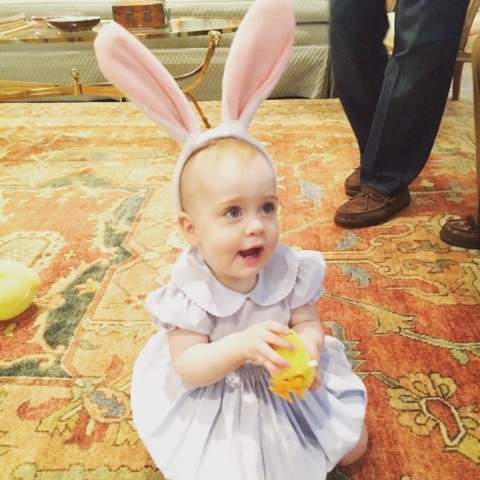 We practiced hunting eggs around the house that morning so she would be prepared. She LOVED spotting the egg and was pretty serious about putting it in the basket. Developmentally she is at a point where she really likes taking things out and then putting them back in whatever they came from or into another container, so the hunts hit at a perfect time for her. At the party I walked around with her to pick up eggs and we would leave one here and there--or at least I tried to. Miss perfection would leave no egg behind--if she saw it, it went in the basket. She acted the same way that evening at the Easter egg hunt to celebrate John Robert's baptism--no egg left behind. She didn't care that the kids were bigger than her or were running around--she was going to methodically collect those eggs and Mommy had better be right behind her with the basket, not chatting with friends. I love seeing little bits of her personality--and I have to admit responsibility for that methodical behavior--that's all me. On Easter Sunday we went to early church (as usual) and I have to say C was kind of wound up, but she looked pretty in our latest Ivory Pony creation!! 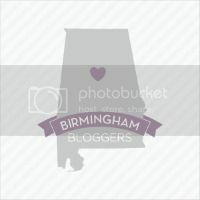 After a nap we went to lunch with my mom's family in Birmingham. C (while wearing her 4th Easter outfit of the weekend) loved visiting and especially loved playing with the Easter eggs and bunnies Aunt Fran found for her. We had to leave pretty quickly after we ate so that she could nap in the car (this nap transition is still going on!) but it was a nice visit. I love that for a few years, each holiday will be so different. There was such a change from last year to this year and I know next year, when she understands the Easter bunny (or I guess she will--which means I have to do a basket) and can really run around and find eggs will probably be even more fun. 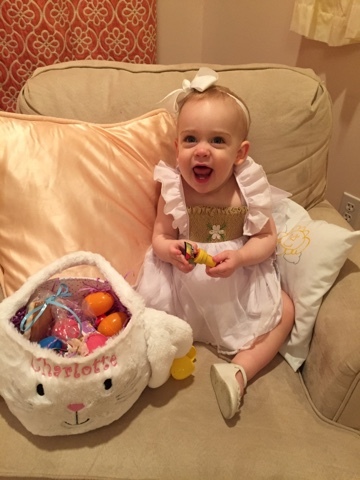 She also should start to be able to understand more about the real meaning of Easter and I know that Forrest and I will enjoy sharing our faith with her.